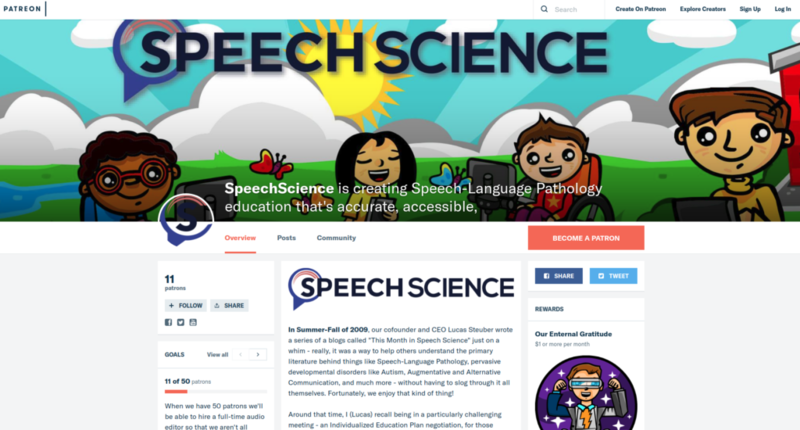 SpeechScience begin back in 2009 with a series of blogs called “This Month in Speech Science.” In those blog posts, cofounder and CEO Lucas Steuber wrote to help others understand the primary literature behind things like Speech-Language Pathology, pervasive developmental disorders like Autism, Augmentative and Alternative Communication, and more. Speech Science today provides resources such as podcasts, blogs, and videos. Their podcast for example is hugely successful. So far the team has produced three podcasts shows titled “Swallow Your Pride” on feeding and swallowing disorders; one called “Talking With Tech” focused on technology in special education, and the final podcast or “core” focuses on issues in Speech-Language Pathology and interdisciplinary concerns. These podcasts have already generated a total of 100,000 downloads! Not a small accomplishment for just three podcasts. There is a podcast for everything, they go in depth and are well reviewed on iTunes. Check all three podcasts out they are well worth your time. Speech Science also has an app on Amazon’s Alexa. It shares speech facts to users. Why They Set Up Campaign? They have a good problem in that they are growing fast, but to keep up with the demand they need funding. To make matters more difficult Speech Science is very selective with the funding they take. The last thing they want to do is compromise their mission or become beholden to an advertiser for example. The goal of this campaign shouldn’t be to get a reward, it should be to help, but still Speech Science provides great rewards for this campaign. $1 level gets you a big thanks from SpeedScience, $5 per month gets your name posted as a sponsor on their web site and the ability to contact them at any time with technical or academic questions. $10 or more per month gets you previous benefits plus a Patreon only audio/video feed, additional material from celebrity and academic interviews, and much more. Not only that, you’ll receive a free month’s subscription to The Informed SLP. The rewards go all the way up to $500 or more per month. $500 gets you all previous rewards plus get a guarantee that every single month you will fund either an augmentative communication device, a full swallowing/dysphagia study, or $500 of therapy for a student in need. Speech Science is counting on you. “Maybe our only mission, is to shed back a bit of that horror – that darkness – and share information that is evidence-based, efficacious, and couched with a bit of humor to dull what can otherwise be a punishing world.” Sign up only takes minute and donate anything from $1 to their $500+ level. Becoming a patron will make a difference.